Fie upon ye, food snobbery. 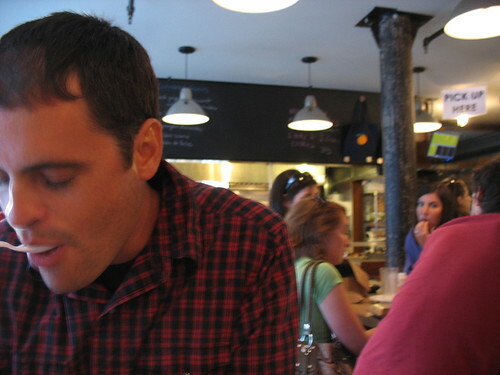 It has come to pass, even recently, that I have been accused of food snobbery. This is an accusation founded in my poking fun at Knorr and Lipton just-add-milk-or-water-chicken-flavored noodle side dishes, and “critter wine”. And yes, maybe I am a tiny bit of a food snob, at times. But come on! Not everything I make requires five thousand steps and is from scratch. I used canned pumpkin a few posts ago instead of pureeing and roasting my own, and I’m currently waiting for a weeknight-storebought-ravioli-jarred-sauce-pre-cooked-chicken-sausage-processed-shredded-mozzerella casserole concoction to come out of the oven, which smells deliciously Chef Boyardee-esque. Just because I make marshmallows from scratch doesn’t mean I’m not seduced by packaged brownie mix. I frequently buy bagged salad (even the Caesar kit kind). I’ve never made fresh pasta of my own volition even after witnessing my Mom and Nonie make it a million times. And I NEVER make my own pastry piecrust. Ever. The aforementioned Mom and Nonie would never allow it. They’ve always told me that the difference in flavor and texture is not worth the effort – that I should take my time perfecting the filling and let Pillsbury (specifically) handle the rest. And they are so totally right, in my opinion. I’ve made pie and tart crust a couple times from scratch, here and there, and yeah…not much difference. (Jus sayin’, graham cracker and cookie crusts don’t count, simply for the fact that they don’t necessitate a pastry cutter, and they require excess amounts of Vanilla Wafers rather that patience). Proudly buying Pillsbury pastry piecrust is a practice I embrace, even for the most refined of pies – like the tropical coconut custard pie I’m about to share with you. Buying pre-made crust from the grocery reduces your time and effort dramatically with this one – rather than blind baking the crust for 45 minutes as you would with the homemade, you simply have to unroll this gift from heaven and bake it for 10 minutes. Then cool it, fill it, chill it and you can return to whatever else it was you were doing…AND have a delicious, toasty coconut silky custard pie at the end. It’s like having your cake and eating it too…especially if it’s a delicious Funfetti cake-mix-cake, straight from the box. from Martha Stewart Everyday Food, tweaked a bit! Place your pie crust in your desired pie plate and bake as instructed. If it's store bought it will probably be for about 10 minutes at 400˚...Just read the box! Convenience! Homemade it will take about 45 minutes at the same temp...basically until lightly browned. Set aside and let crust cool completely. In a medium saucepan off heat, whisk together sugar, cornstarch, and salt. Gradually whisk in whole milk, making sure to dissolve cornstarch. Whisk in coconut milk and egg yolks. Whisking constantly, cook over medium heat until the first large bubble sputters, about 5-7 minutes. Reduce heat to low and cook, whisking constantly, 1 minute. Remove pan from heat and pour into a large bowl (M-Stew suggests pouring the custard through a fine-mesh sieve into that bowl. Good luck to you - mine was way too thick to make that possible, and the texture didn't suffer one bit). Pour custard into cooled crust - smooth top with a spatula. Refrigerate until chilled, at least 4 hours, or loosely covered up to 1 day. To serve, let stand at room temp for 30 minutes, then sprinkle with toasted coconut. 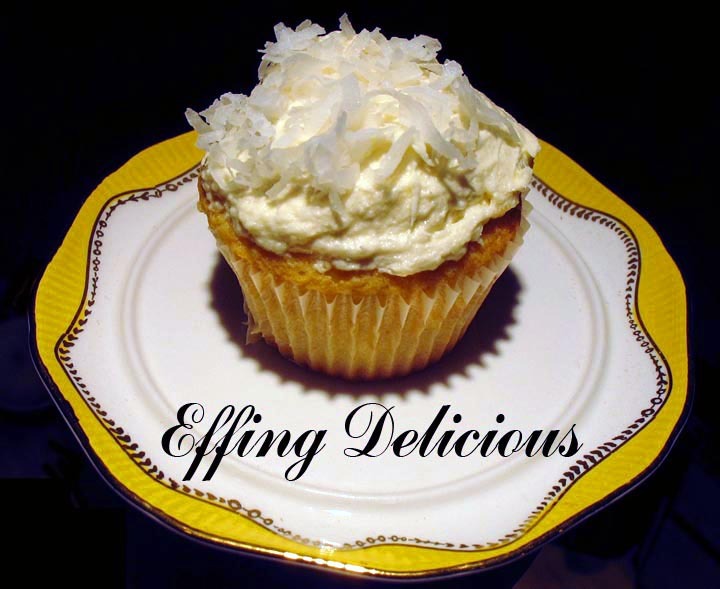 *To toast the coconut, place it on a baking sheet and bake at 350˚ for about 8 minutes. Tonight I’m writing to share with you one of my favorite recipes ever. My good friend Emily gave it to me ages ago, when I was living in an apartment that really should have been the attic to a beautiful Victorian home. As you can imagine, because it was built into an attic, my kitchen left a lot to be desired – it was definitely the worst room in an otherwise kind of amazing apartment. Preparing this dish, a multi-step prep-work-intensive stir fry, in that kitchen was definitely an adventure. I had zero counter space, terrible lighting and a flakey gas range/oven that would frequently take it upon itself to try to burn the house down. Nostalgia aside, mentioning the attic kitchen is my way of letting you know that even though this recipe probably seems fussy and like too much work, if I did it in that crazy attic kitchen you can do it too (in your hopefully non-attic kitchen). Whenever I make it I think of that kitchen and its weird drafty haunted pantry, flame-throwing broiler and iffy plumbing…sigh. Anyway, the stir-fry – picture sesame-coated thinly sliced chicken tossed with fresh green beans and shiitakes, in a garlicky, gingery perfectly spicy sauce flecked with more sesame seeds, scented with toasted sesame oil. Yes, the recipe involves making a marinade, a coating for the chicken, a stir-fry sauce and a garlic ginger paste, but it is sooo worth all the complication. The flavor layering is delightful. This recipe originally came from Cooks Illustrated, and it honestly has no room to be improved upon that I can find. I’m sure they made it every which way before publishing, and they are certainly dead on here. Combine soy sauce, sherry and water in a medium bowl. Add chicken and break up clumps. Cover with plastic wrap and refrigerate for 20 minutes to 1 hour. Mix sesame oil, cornstarch, flour and sesame seeds in medium bowl until smooth. Drain chicken in a strainer, pressing out excess liquid. Toss in cornstarch/flour mixture until evenly coated. Whisk chicken broth, soy, sherry, chili sauce, sugar, cornstarch, 2 teaspoons sesame seeds, 1 teaspoon sesame oil, and 1 teaspoon garlic in small bowl to combine. Set aside. Combine remaining two teaspoons garlic, ginger and 1 teaspoon vegetable oil in a small bowl. Set aside. Heat two teaspoons vegetable oil in a large nonstick skillet or wok over high heat until smoking. Add half the chicken in an even layer and cook until golden brown. Flip and cook until lightly browned on the second side, less than two minutes total in the pan. Transfer to clean bowl and repeat with more oil and the rest of the chicken. Add 1 teaspoon vegetable oil to the now-empty skillet and heat until just smoking. Add green beans and cook stirring occasionally, 1 minute. Add mushrooms and stir-fry until mushrooms are lightly browned, about 3 minutes. Push veggies to the sides of skillet or wok to clear center. Add garlic ginger mixture to the clearing and cook, mashing with a spoon, until fragrant, about 30-45 seconds. Stir mixture into beans and mushrooms. 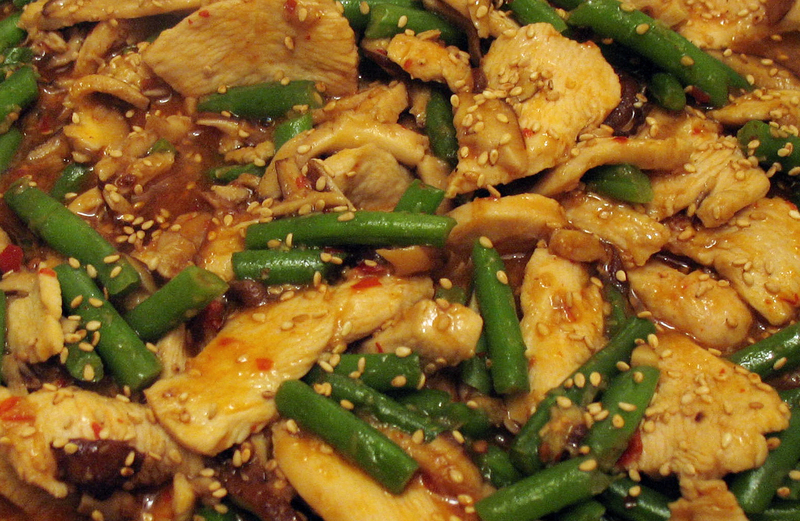 Continue to stir-fry until beans are tender-crisp, about 30 seconds longer. Return chicken to skillet. Whisk the set-aside sauce to recombine then add to skillet. Reduce heat to medium and cook stirring constantly, until the sauce is thickened and the chicken is cooked through, about 30 seconds. Transfer to serving platter, drizzle with remaining teaspoon sesame oil and sprinkle with remaining teaspoon sesame seeds. Serve immediately, with jasmine rice if you like. Pumpkin Two Ways: Fancy, not so Fancy…Part 2! You need to act, and fast! As promised, here is Part 2 of my pumpkin adventure from the long weekend, just in time for this weekend – Pumpkin Pancakes. Yes, they incorporate many of the same ingredients as the cake but the trick is, they are acceptable to have for breakfast! Magical. And, I promise that you won’t find them redundant of the cake. As any good pancake does, they retain their savory qualities despite the inclusion of some warming spices and sugar…and pumpkin of course…savoriness that you can easily destroy (or compliment), if you wish, with maple syrup. Whisk flour, sugar, baking powder, spices and salt in a large bowl. In a separate bowl, stir together milk, pumpkin puree, butter and egg. Fold wet mixture into dry ingredients. Melt some butter in a skillet over medium heat. Pour in 1/4 cup of batter for each pancake. Cook about 3 minutes per side, or let your pancake intuition guide you - everyone has pancake intuition and I would never step to yours. Serve however you like. Makes 8 to 10 pancakes. Pumpkin Two Ways: Fancy, not so fancy. Exhibit A. One can of delectable organic pumpkin. Innocent, yet alluring. One of the usual suspects as October rolls around, it can be incorporated into a zillion different recipes, from savory to sweet and back again. Pumpkin found its way into my heart as a kid, when I was the only cousin willing to try the “gross looking” pie, and it is still one of my absolute favorites. I get really fired up about fall cooking, and the squash family is largely responsible. Going toe to toe with a legit, for reals pumpkin is a chore. It can be awesome – I’m sure many of you have toasted pumpkin seeds on your way to making a jack o’ lantern, and perhaps you’ve even roasted the whole thing to make your own puree, because you’re brave. I wasn’t feeling brave this weekend. And that is why the lead picture for this post is a can, not a blob of pumpkin guts. Because sometimes, albeit rarely, a canned fruit or veggie is okay. Especially in this case, when I could find a nice organic product at the grocery, with ONE ingredient – pumpkin. This lil can turned into a whole lot of deliciousness. One half went into a decadent pumpkin spice cake with a caramel cream cheese frosting. And because I cannot stand to waste food, and the leftover pumpkin was calling to me from the fridge, I found a fantastic way to use the rest…but we’ll get to that later. For now, it’s cake time! I found this recipe a while ago in Bon Appétit. It’s an offering from Sarah Patterson Scott, co-author (with Connie Green) of The Wild Table, a book on foraged food and recipes coming out later this month. Maybe Sarah expected me to forage for my pumpkin, and for that, I apologize. But honestly this cake needs no apologies. The original recipe creates a two layer cake, but I cut it down to one because I was looking for something smaller and more casual, but still all schmaltzy and rich and covered in buttery heavenly frosting, with a feisty hint of citrus. So the recipe below is tweaked a bit from Sarah’s, but works like a charm. The frosting is labor intensive as it requires one to make caramel from scratch, but it is well worth it. So this is Part 1 of Pumpkin Two Ways…fancy. Stay tuned for Part 2…Not So Fancy! Preheat oven to 350˚. Butter and flour a 9-inch cake pan, tapping out any excess flour. Whisk first 9 ingredients in a large bowl. Using an electric mixer, beat pumpkin, sugar and oil in another large bowl. Add eggs one at a time, beating to incorporate between additions. Mix in orange peel. Add flour mixture, beat on low speed just to blend. Pour batter into prepared pan. Bake cake until tester inserted into center comes out clean about 30-33 minutes. Cool in pan for 10 minutes, then invert onto rack, turn top side up and cool completely. Sprinkle 1/4 cup powdered sugar evenly over bottom of a small nonstick skillet (you are about to make the caramel, get ready!) Cook over medium heat until sugar melts (do NOT stir yet - I know it's hard, but you'll wreck it). Continue cooking until sugar turns deep amber, stirring occasionally, about 1 minute. Carefully stir in 1/4 cup cream, vanilla, and salt - things will get mighty bubbly here. Stir until any caramel bits dissolve. Stir in remaining splash of cream. Strain into a small bowl, and cool to room temperature. Sift remaining powdered sugar into a medium bowl. Using electric mixer, beat cream cheese and butter in a large bowl. Gradually beat in powdered sugar, scraping down the bowl with each addition. Beat in cooled caramel. Taste, liberally. Cover and chill frosting until firm enough to spread, about 2 hours. When ready, frost cake evenly. Sprinkle cake with a bit more grated orange zest for a punchier citrus flavor, if desired. This past weekend I was in the magical land of New York City. I had a lot to accomplish in just over 24 hours - seeing a friend off who is leaving for new adventures overseas, catching up with other friends for the first time in what seems inappropriately long...and celebrating one very special lady who is tying the knot with her beloved later this month! 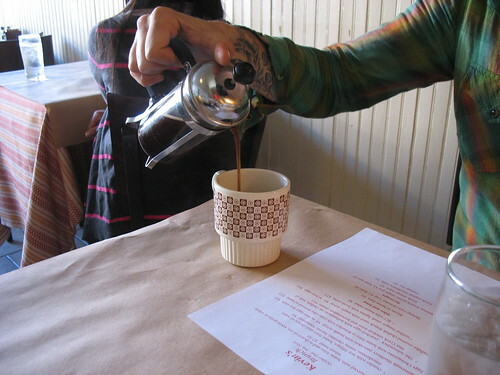 Brunch on Saturday morning was at Kevin's in Red Hook, a great artsy/industrial section of Brooklyn often overlooked thanks to its lack of good public transportation. Kevin's is a small, unassuming place with a yummy menu...we loved the tiny french presses full of amazing Stumptown Coffee. My model above is demonstrating a perfect pour - thanks Liam! 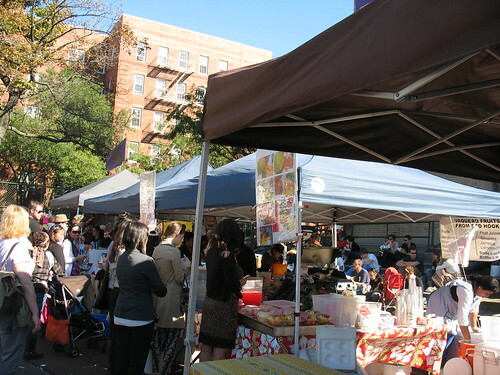 Later that day we hit the Brooklyn Flea in Fort Greene, the best part of Brooklyn, in my opinion. This is a massive flea market chock full of quirky antiques, awesome handmade jewelry, and to die for food tents. 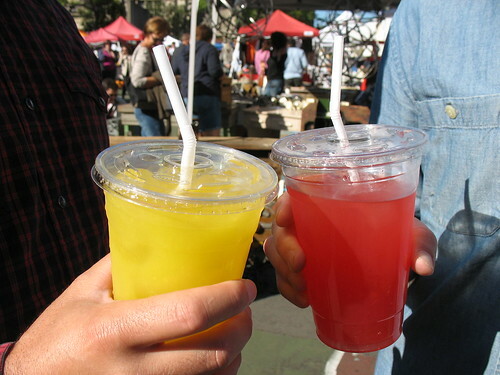 The lines were pretty crazy, but we were able to sneak in and grab some amazing fresh juices from the Vaquero Fruits tent...mango and watermelon...delicious. We made a special trip to Momofuku Milk Bar. I insisted, after trying their recipes and completely adoring them. It was a really interesting place - not like normal bakeries where everything is out to tantalize you...it was actually kind of odd that everything came to us from behind high counters, sometimes weirdly pre-packaged...but not odd in an unpleasant way...just mysterious for a bakery...but I guess they have their own thing going. 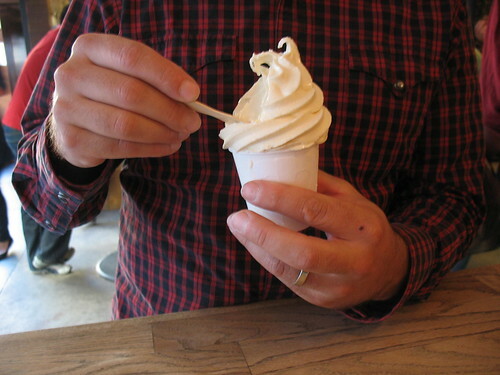 The soft serve pictured above is their patented Cereal Milk flavor...also kind of unexpectedly authentic tasting...like organic Captain Crunch had soaked in the milk they used. It wasn't love at first sight, but it grew on us. 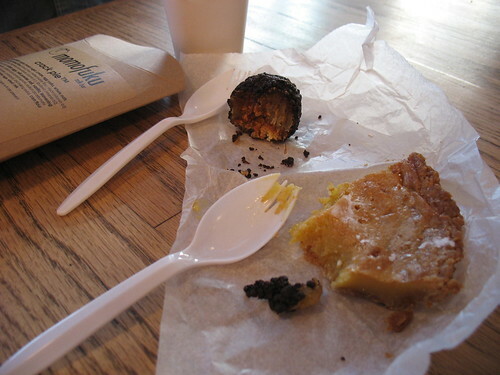 The buttery sugary Crack Pie, however, was to die for, as well as the rich yet crunchy Banana Cake Truffles. Our friends also got potato chip ice cream...which was flat. out. terrible. We had planned to make it a Momofuku-double-feature and head to Noodle Bar as well, but the line was crazy when we got there, and I would have been late for my amazing burlesque class. So, we headed to Ramen Setagaya on St. Marks and were not disappointed with the giant, delicious bowls of noodles waiting for us there. 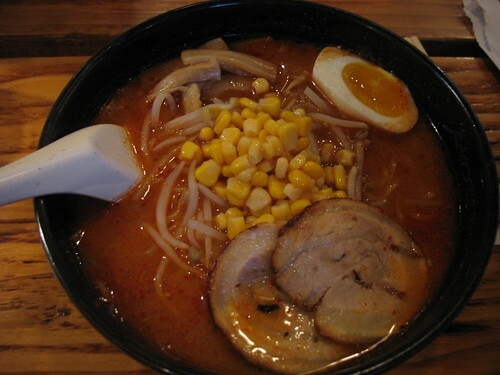 Mine was BBQ pork, veggies and a salty egg in a spicy miso broth. Top notch. We're planning to head to Noodle Bar next time, so we'll see how the two compare. I'm excited to try the authentic versions of dishes I love to make at home! 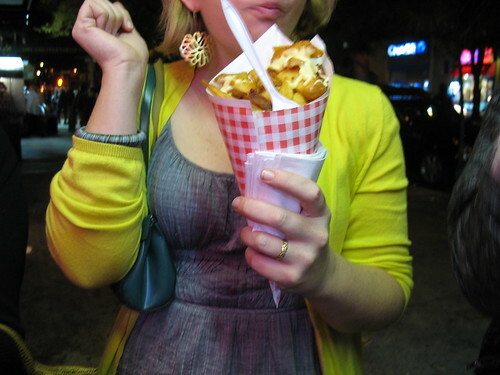 After a hard night of learning five ways to take off satin elbow gloves, then heading out for drinks, my girlfriends and I found ourselves at Pommes Frites in the East Village. My lovely french fry model Jill here is showcasing the delicious Belgian fries we treated ourselves to, with frites sauce (probably just mayo, methinks). 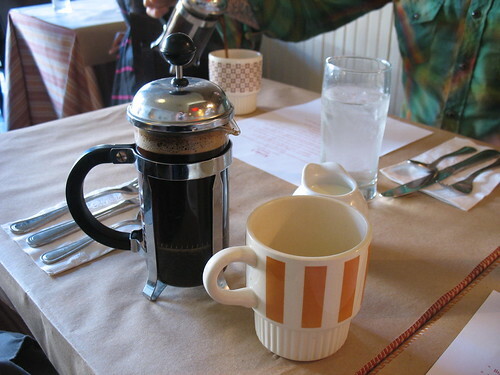 Our last meal in town this time was Sunday morning, at Pequena, in Fort Greene. 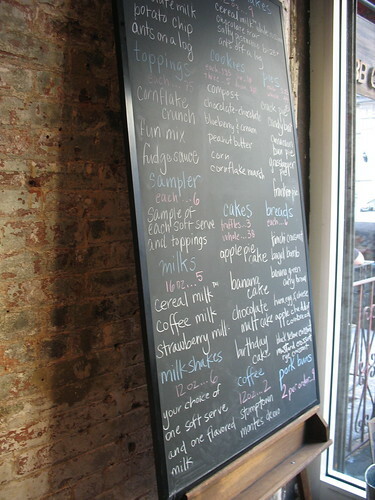 It's a tiny, amazing Mexican place that has a crazy breakfast menu - the stuff of dreams. 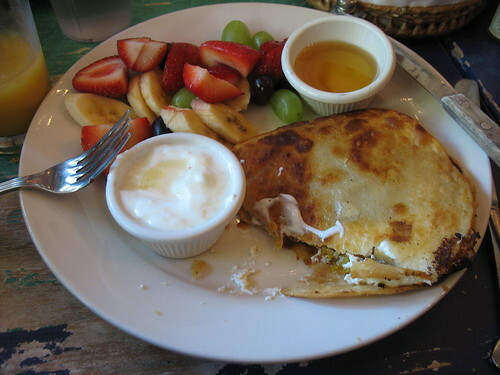 The dish pictured above was amazing - two super crisp tortillas cradling fried plantains and creamy cheese, served with fresh fruit, yogurt and honey. Heaven. Over all we had a blast this weekend, even if it was really only 24 hours - can't wait to do it all over again at the end of the month...stay tuned for Food Tour Part 2! Leave me a comment if you know somewhere I shouldn't miss!